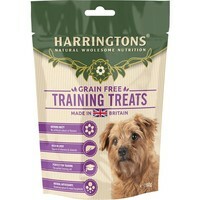 Harringtons Grain Free Training Treats for Dogs are delicious natural treats made with wholesome grain free ingredients that make the perfect training aid. Made with no artificial colours, flavours or sugar, the treats contain natural antioxidants and are rich in Liver, which is a great source of vitamins and minerals. Suitable for all dogs over 8 weeks old. fantastic product. All the dogs I walk with love this treat. I bought these treats on the recommendation of an experienced dog trainer. They are great! My dogs love them and i dont buy any other treats now. They are too large for my dogs but i break them up. Great product and great price! Best treats ever - I do not buy anything else now. These are brilliant. Trusted ingredients, dog loves them and great price.